Local designers share their tips for creating eye-popping yet functional kitchens. High-drama finishes in a modern Ritz-Carlton kitchen redo. Less is more in today’s kitchen, with the biggest trend by far being clean, contemporary design. But that doesn’t mean you can’t spice up yours with eye-popping materials and smart organizational options. In Sarasota, we’re seeing everything from kitchens with high drama, like the remodeled kitchen Kurt Lucas of JLK Design Group created for a bachelor client’s Ritz-Carlton condo, previous page, to a fuss-free traditional kitchen, above, by Missi Bart of Renaissance Design Studio in a Longboat Key residence that was a finalist for the Wall Street Journal Home of the Year. 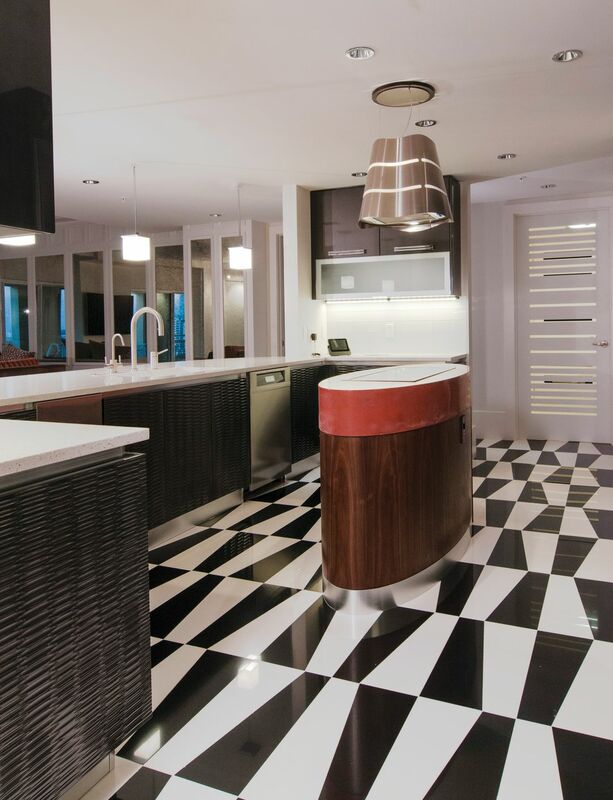 In the Ritz condo kitchen, Lucas chose charcoal gray, high-gloss lacquered cabinets with an unusual textured finish, a geometric patterned black-and-white Porcelanosa tile floor, an oval island with what he calls a “gutsy” orange concrete countertop and a sinuous stainless steel vent suspended over it that looks like a great modern light fixture. The countertops are all clean, white Caesarstone. Lucas doesn’t think his client, a single man, has ever turned on the Gaggenau cooktop that’s embedded in the island, but no matter. “It’s a great kitchen for entertaining; that’s where everyone hangs out,” he says, and to him, that makes it a success. This traditional kitchen in a Longboat Key residence pares away the frills for a contemporary edge. 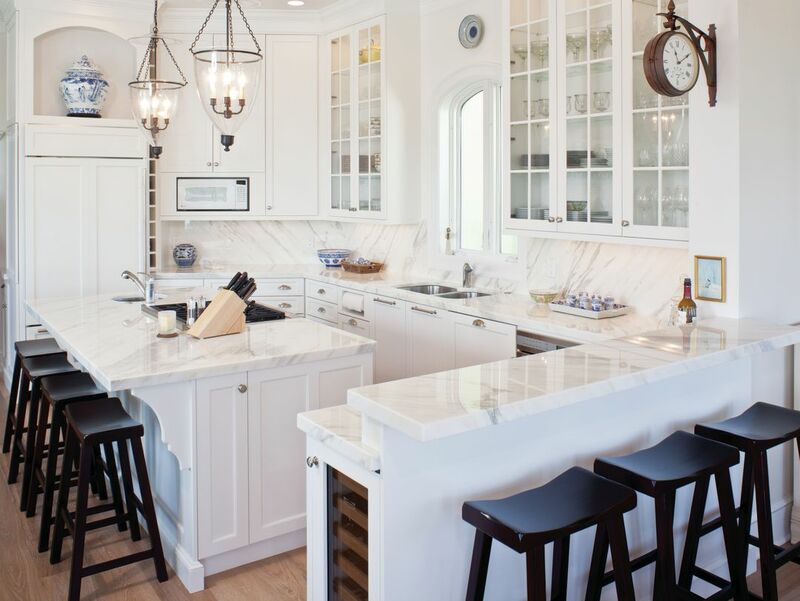 In the custom Longboat Key kitchen, Bart took the best of traditional kitchens—crown moldings, bright white Shaker cabinets (the uppers are glass-fronted and mullioned), Calacutta marble countertops with a hefty two-and-a-half-inch mitered edge and a Calacutta marble backsplash—then pared away the frills. “It’s really timeless; there aren’t a lot of fussy details,” Bart says. “The homeowner thought even the corbel (on the island) was a bit too fancy, but we had to do a gentle curve to make room for people’s knees when they sat down.” This is truly custom design, with a built-in paper towel holder above the pullout garbage cabinet to the left of the sink, and the sliver of a built-in wine holder to the right of the refrigerator. “She wanted a little spot for her red wines at room temperature,” says Bart. The home was designed by architect Cliff Scholz and built by Murray Homes.